Our Abpromise guarantee covers the use of ab3105 in the following tested applications. IHC-Fr Use a concentration of 1 - 10 µg/ml. Fix with acetone. IP Use a concentration of 1 - 10 µg/ml. IHC-FoFr Use a concentration of 1 - 10 µg/ml. 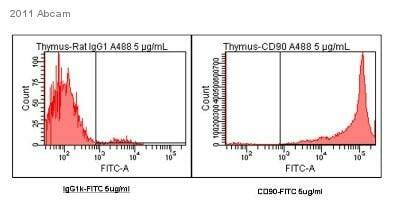 Flow Cytometry - Anti-CD90 / Thy1 antibody [IBL-6/23] (ab3105)Image courtesy of an anonymous Abreview. ab3105 used in Flow Cytometry. ab3105 used at 5µg/ml to stain murine thymus cells. The secondary used was an Alexa Fluor 488 conjugated goat anti-rat IgG monoclonal, used at a 1/1000 dilution. Immunocytochemistry/ Immunofluorescence - Anti-CD90 / Thy1 antibody [IBL-6/23] (ab3105)Image courtesy of Ms Sophie Nadaud by Abreview. ab3105 staining CD90 / Thy1 in murine bone marrow cells (smeared directly onto glass slide) by Immunocytochemistry/ Immunofluorescence. Cells were fixed in paraformaldehyde, permeabilized using 0.5% saponin, blocked with 1% serum for 1 hour at 37°C and then incubated with ab3105 at a 1/300 dilution for 16 hours at 4°C. The secondary used was an Alexa-Fluor 546 conjugated goat anti-rat polyclonal used at a 1/400 dilution. Dapi stains nuclei in blue. Immunohistochemistry (Formalin/PFA-fixed paraffiin-embedded sections) analysis of mouse spleen tissue labelling CD90 / Thy1 with ab3105 at 1/100. Antigen retrieval was heat-mediated with citrate buffer pH 6.0. Publishing research using ab3105? Please let us know so that we can cite the reference in this datasheet. 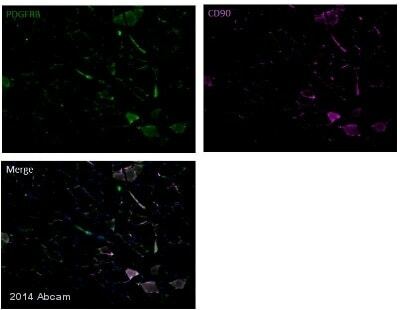 Hi I am looking for an antibody that will detect stromal cells in mouse but that will not detect human cells Do you know if the CD90 antibody (ab3105) crosses reacts with human? Thank you! I can confirm that ab3105 was tested on formalin-fixed paraffin-embedded tissue sections from human reactive tonsil but we didn't detect signal with this antibody. Thank you for contacting us. Abcam takes product quality seriously and we recently undertook an in-depth study examining storage conditions and antibody performance. After over 13,000 individual ELISA experiments, we have determined that storing our antibodies at various temperatures of up to 45°C for 1 week does not impact their activity. I would be happy to share a summary of our findings with you; please let me know if you would like to see this. As a precautionary measure only, we ship our antibodies in packaging with ice packs to provide extra temperature stability in transit. The ice pack may be thawed or even at room temperature when you receive it; please be assured that this is normal and that your product is safe to use. Once you have received the vial, please follow the long-term storage instructions on the datasheet. Our Abpromise to you is that, should our product not work as stated on the datasheet, we will resolve the issue to your satisfaction, either with helpful advice to optimize your experiment or a replacement or refund of the product. Please contact our knowledgeable Scientific Support staff should you experience any issues while using our products. Contact information can be found at: https://www.abcam.com/index.html?pageconfig=contactus I hope this information is helpful to you. Please do not hesitate to contact us if you need any more advice or information. PS: Attached is the tested data of few of our antibodies. 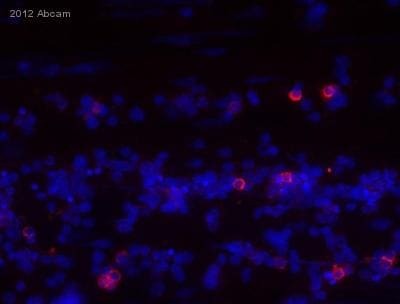 Recently purchased the above antibody for staining cells in culture. For initial experiment I fixed cells in 4% paraformaldehyde and got pale staining of fibroblasts. Could you please confirm if best to fix cells first or to use live?